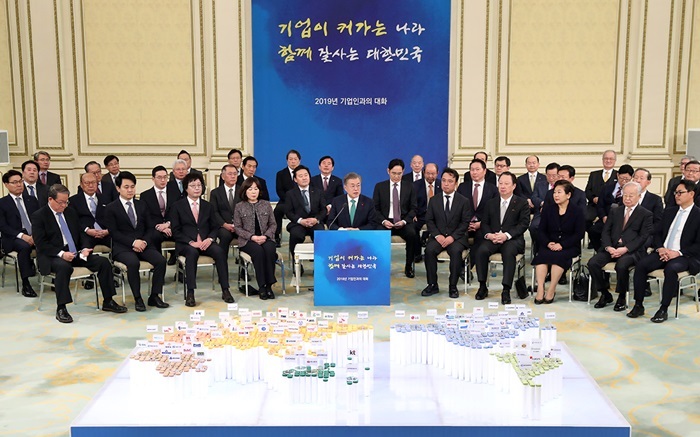 President Moon Jae-in on Jan. 15 asked the CEOs of major Korean corporations to work together toward boosting the economy by raising employment and investment. Held in the format of a town hall meeting as part of the president’s measures to boost the economy, the two-hour meeting saw more than 130 businesspeople from large companies and small and medium-size enterprises (SMEs) attend. “Korea’s exports last year hit a record USD 600 billion and made the country the world’s sixth-largest exporter,” he said at the gathering. Expressing a strong will to support business activities, he requested that the business leaders take the lead in stimulating investment and job creation. “Employment and investment both serve as the foundation for companies to grow and secure future growth momentum,” the president said. “Corporate competitiveness and quality jobs all come from investment,” he added, asking the executives to create more business opportunities and raise investment. President Moon also held a Q&A session with the participating CEOs, who made proposals for regulatory innovation. Pledging to achieve bold innovation in the sector, he said, “Regulatory innovation will be also accelerated for fostering new industries.” He also mentioned the introduction of the regulatory sandbox, a system that lifts or postpones regulations for a certain period of time in new industries. President Moon also asked the businesspeople to play a leading role in transforming the Korean economic model into a pacesetter. He also promised that with an R&D budget of more than KRW 20 trillion, his administration this year will promote next-generation fields such as the hydrogen economy, future vehicles, biotechnology, non-memory semiconductors and 5G-based industries as potentially new engines of growth. After the discussion, President Moon took nine of the CEOs for a walk around Cheong Wa Dae and discussed issues such as inter-Korean business cooperation, semiconductors and biotechnology. A day after the event, Cheong Wa Dae announced plans for pro-business support by forming a large task force for investment projects.